Introducing Our 7 Series Sewing Celebrities! To help us, we have hand-picked 5 super-special sewing celebrities (say that five times fast!) to play with and experience our newest offerings. 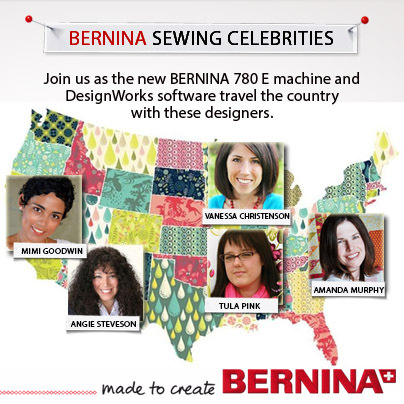 The B 780 E sewing and embroidery machine will spend the rest of the year traveling across the country to meet each of these lovely ladies, spend time in their sewing studios, and inspire them to create on a whole new level! Over the next couple months, you will be introduced to each celebrity and get an up close and personal look a their experiences with the new machine and software.